Designed for automatic parallel partitioning and molecular barcoding, the new Chromium platform unlocks cell-by-cell gene expression profiling as well as long-range genomic. The system currently supports single cell 3′ RNA Seq counting for single cell transcriptomics, which performs deep profiling of complex cell populations (up to 10,000 cells/sample) with high-throughput digital gene expression on a cell-by-cell basis. Future application include single cell VDJ repertoire analysis as well as long-range information for phasing structural variant detection and copy number determination on a genome/exome-wide scale. 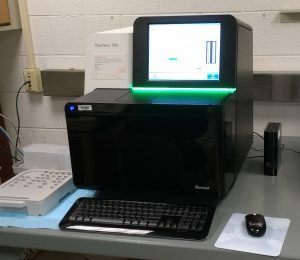 This is the first desktop high-throughput sequencing system that can perform whole-genome sequencing, exome sequencing and RNA-Seq. 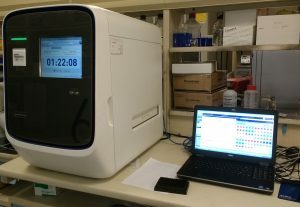 In a single run, NextSeq 500 can generate in High output mode 400 million reads and sequence up to 80 small RNA sequencing experiments (5 M reads per sample), 40 RNA profiling experiments (10 M reads per sample), 30 chip-seq experiments (15 M reads per sample), 12 transcriptome sequencing experiments (40 M reads per sample), 12 exome sequencing experiments (100X on average), One human whole genome sequencing (>30X coverage). 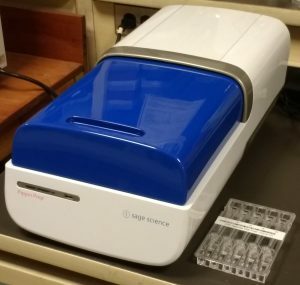 This desktop sequencer allows access to more focused applications such as microbiome (bacterial and fungal) amplicon sequencing, metagenomics, small genome sequencing, starting at 10 ng DNA. 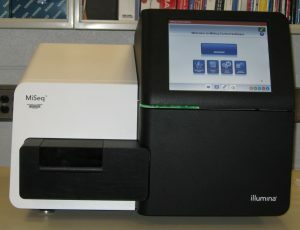 New MiSeq reagents enable up to 25 M sequencing reads and 2×300 bp read lengths. 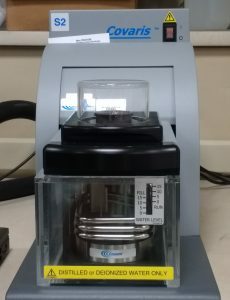 The droplet generator divides the sample, with primers and PCR mix into 8 batches of 20,000 nanoliter sized droplets using water-oil emulsion technology. The DNA is amplified in the thermo cycler, then the reader measures fluorescence in each droplet single file fashion. 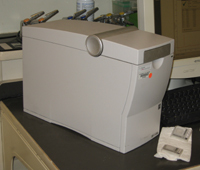 Includes droplet generator, droplet reader, plate sealer, thermo cycler. Real-time quantitative PCR (qPCR) is a highly sensitive and specific method for SNP genotyping and for amplifying, detecting and quantitating target transcripts. The QuantStudio 6-Flex enables detection as small as 1.5-fold changes in singleplex reactions and with 10 logs dynamic range. It can also be used to identify new variants quickly and accurately with high resolution melt. The core is offering a full range of sizing applications for DNA and RNA, and for true end-to-end sample QC for the NGS workflow. 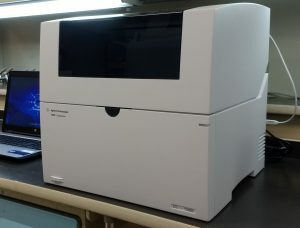 The Agilent BioAnalyzer operates with microfluidic chips to assess the size distribution of 11 dsDNA samples at a time. The more recent enables the analysis of up to 96 samples at constant cost per sample and its ready-to-use ScreenTape consumables enable easy switching between assays. Both platforms support ‘regular’ and high-sensitivity reagents best fitted to the investigator’s RNA/DNA input. This instrument shears nucleic acids into suitably sized pieces for Next Generation Sequencing using focused acoustic energy. Commonly a sweep of acoustic frequencies is applied to the sample. 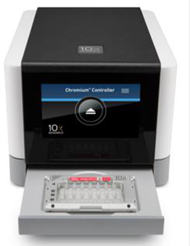 Covaris has protocols to shear DNA to sizes of 150 to 1500 base pairs. This instrument prepares libraries of a specific size, or size range between 100 bp – 1.5 kb. When the size(s) of interest are eluting from the end of the gel, an electrode in a collection chamber directs the DNA to the collection chamber. Run time is less than 2 hours. The size of fragments is estimated from fluorescently labeled standards. for quantitation of small numbers of DNA and RNA samples by fluorescence, 2 µL of sample required. 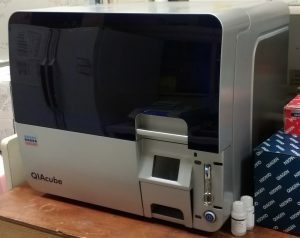 QIAcube for semi-automated nucleic acid extraction using QIAGEN spin column kits. 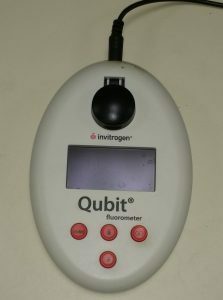 In addition to reducing hands on time, the QIAcube can give more reproducible results than a manual procedure.